Sarpsborg's RAGNAROK is amongst a rare breed of Black Metal bands that maintained that they were true practicing Satanists. The group was borne out of a previous trio named THOTH citing a line-up of Jerv, Jontho Pantera from KHARON and drummer Evil Possessed. With the exclusion of their drummer the remaining duo founded RAGNAROK enlisting KHARON members drummer Thyme as lead singer and Rym Vicious (a.k.a. Øyvind Trindborg) as guitarist. 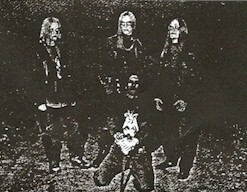 RAGNAROK's introduction onto the scene came with the February 1995 'Pagan Land' demo, recorded in a small studio called Haga Audio located in Sarpsborg. Notably the cover art for this demo was executed by the MAYHEM, PERDITION HEARSE and SHADOW DANCERS credited Cultoculus. Missing scans: Was there a cover for the Promo track? Xerox covers on regular tapes. Apparently two different versions were made of this demo, one recorded at Haga Studios, and one recorded at X-Ray Studios. Both demos have the same tracklist, and the same front-cover.